Sad Sally, Happy Hanna: Sally Gets Tough! Best of the Vault: Love Your Leftovers! Best of the Forum: Waste Not, Want Not! I hope you are having a lovely month. Things have been busy in the Lippey household. Six weeks ago our dogs had puppies. Well... one puppy, and we have been having a ball caring for it. Here is a photo. How cute is she? If you would like to see more photos, here is a link to her forum thread. P.S. The Savings Vault now has 18,000 money saving tips in it. To read the tips and hang out in the forum with us. Grab a membership for $27. 1. Sad Sally, Happy Hanna: Sally Gets Tough! "Psttt, Dad," whispered Josh, sidling up to Pete. "There's something wrong with Mum. Something REALLY wrong." Pete looked up from his afternoon tea. "What do you mean? What's happened?" Sal was standing in front of the kitchen bin jiggling a jar of coins. She pointed at the half eaten apple Josh was holding. "She won't let me throw my apple out!" Josh whined. "She says I have to give her money! Dad, Mum has flipped." Pete laughed, "Josh, it's because you've only eaten half your apple. We are sick of the waste of food in the family so we brought in a 'Swear Jar'. Any time someone throws out food, they have to put a dollar in the jar!" Josh gulped, "ONE DOLLAR?! Are you BOTH mad? Alright, alright, I'll eat the apple." Josh frowned, "Wait...what about my lunch box?" Wasting food is a habit we all need to break. A great way to do that is to bring back the old-fashioned swear jar! This will get you thinking. It will make you aware of how much food you are wasting and inspire you to improve your habits so you don't throw food out. This month we want you to put a jar near the bin and every time you go to throw out food, you need to put a coin in the jar. If you empty uneaten food from school lunch boxes in the bin, put a coin in the jar. If you are cleaning out the fridge, put a coin in for every item of food wasted. If you are clearing half eaten plates from the table, put a coin in for every plate. If you are throwing out vegie scraps instead of composting them or turning them into stock, put a coin in the jar. If you are throwing out leftovers, put a coin in the jar. If you are throwing out fruit instead of freezing it for smoothies or baking, put a coin in the jar. If you are throwing out crusts instead of freezing them for breadcrumbs and coatings, put a coin in the jar. Any time you throw out food that could have been eaten if you had been more organised or did things differently, you need to put a coin in the jar. This will make you aware of what you are doing and how you can improve your habits and save a big pile of money. How do you think you'll go? Let us know on the Forum or the Facebook Group. 3. Best of the Vault: Love Your Leftovers! Here are some great ideas from the Vault to help you look at your 'rubbish' just a little bit differently! I no longer waste delicious cooked leftovers since I learned how to turn them into a whole new meal! I was regularly throwing out leftovers which had gone uneaten and past their best. In the past week alone I had thrown out bolognese, left over lamb shank and some roast chicken, plus the vegies I'd made with them! It made me cringe with every disposal and I knew I needed to find a solution. After racking my brains I found a gift card with $25 spare, so I invested in a pie maker! So far I've made curry pies and left over chicken pies and they are going down a treat instead of being thrown away. It may not be great for the hips, but perfect for the hip pocket! In the last year I have saved over $300 on my vegetable bill and have increased my family's health! As a busy working single mum I used to find some of my vegetables would rot before I got around to using them. When I started to examine this waste of food, I realised I was wasting vegetables all the time! So, I purchased a box of super-large resealable bags ($1.39 on special). I pop an empty bag in the freezer, and every night after dinner, any left over vegies go in the freezer bag. Also, every Wednesday I sort through the vegies in the fridge. Any that are looking 'dodgy' get used for dinner or chopped up and put in my bag in the freezer. When I'm making sandwiches, all of the ends of the tomatoes go in my bag. When we've had salad, and it has sat in the fridge for a few days and gone limp, in the bag it goes, lettuce and all. Then, when the bag is full - it's time to make vegetable lasagne! I saute a sliced onion, add a tin of tomatoes and chuck in the contents of my vegie bag. The lettuce cooks down to nothing and the kids think it's spinach, the bits of broccoli are lovely and colourful, the carrots add sweetness and the mashed potato thicken the sauce. Most importantly, my children are getting a vitamin-packed meal! Everyone asks for my vegetable lasagne recipe, but of course, I can't tell them because it's a secret! I have a recipe that I use every month or so, which I call my 'End of Days Meatloaf'! It effectively costs me nothing to make as it uses up scraps and leftovers that would have otherwise been thrown away - but it tastes delicious! Whenever I cut up vegies for dinner I throw any bits left over (the stub of a carrot, mushroom stalks, broccoli stalks and so on) into a blender. I also regularly look through the fridge for other 'sad vegies' that are past their best but are still fit for human consumption, such as half an onion, bendy carrots and celery, dried out mushrooms, squishy tomatoes and so on. I chop them all up and add them to the blender too. I also add any left over cooked rice and bread that's gone a bit stale. I blend everything until it's finely chopped and transfer it all to an empty ice cream container that I keep for this purpose in the freezer. Once the ice cream container is full (usually after about a month or so) I mix the blended frozen vegies in a large bowl with an equal amount of mince, a couple of eggs, seasoning and some sauce of choice (this is a good way to use up the half-empty sauce bottles in the fridge). Normally I add BBQ or tomato sauce, soy, chutney and perhaps left over apricot jam or marmalade as well. The mixture should be moist enough to stick together like dough. I then transfer the mixture to a baking tin. I usually get enough for two meatloaves or I fill up a muffin tin and make mini meatloaves which are good for lunch boxes. I cook the mixture in a hot oven for about 40 minutes, depending on the size of the tin(s), and check it regularly to see if it's cooked all the way through. After cooking, I freeze one of the loaves. It's very cheap and easy to make, it's delicious and gives us a big whack of vegies. The muffin-sized mini-loaves make a good snack, and the meatloaf will normally last two people about three dinners, if we have it with vegies or pasta. As a bonus, our fridge gets a regular clean-out and we avoid much unnecessary food wastage. 4. Best of the Forum: Waste Not, Want Not! The hardest part of starting something new is keeping yourself motivated. The Forum is the perfect place to find inspiration, support and encouragement - it's what we do best! Here are some great ideas to get you started. Turning left overs into tasty, delicious sweet or savoury pies is as easy-as! Stop throwing out wilted vegies - here's a tip or two about freezing them for later. Thinking outside the box creates delicious meals! This month's Blog winner is Patricia A. who did a great job 'training the troops'! "The newsletter for June 2015 reminded me of when I was Training the Troops. Argh, such lovely memories now that time has flown by. My eldest son learnt to cook when I had RSI and I couldn't stir a pot of water, never mind a pot with food in it. He was such a great help to me then. When I found that I couldn't cook tea for everyone safely and he offered to help, I decided to use the opportunity to teach him the 'secrets' of cooking. We would discuss what ingredients/food was available and then pick the recipe he would attempt. He would take out the recipe book for me, it was heavy. Then we read the recipe together and started the prep work. While he cooked I rested my arms on the cook book ready to tell him how to do the next step. He did all the work, I just supervised and trained. When we came to sauté the onions I explained what that meant and how to do it. Each little step was followed with explanations for some of the cooking terms. So instead of having to order takeaway or subsist on Vegemite or jam sandwiches we had lovely dinners every night. And my DS received a wonderful education in cookery. The younger DS wanted to have a go too so we did some simple meals that were suitable to his age at that time. My arms recovered and I took up the evening meal cooking fulltime. Five years later, we hit the time when the older DS was working and the younger one was now the age his older brother had been when he cooked for the family. And I was once again in the position of not being able to do all the evening meals without a great deal of trouble. I hit on the idea that we would have a roster for meal making. The DSs were not too happy and the DH was not at all thrilled. I persisted and 'won' the day. I still did the majority of the cooking and I had to be on hand to train the boys. I did seven nights of the fortnight while the DSs did three each and DH did one (he was a shift worker, so I figured that he didn't need to cook every night that he was home for tea). I quickly learnt that having a DS who was working meant he had money to buy takeaway. But I didn't want him using all his cash to buy us meals when there was food in the cupboard. So takeaway was restricted to once a month only and with parental approval. A list of meals that we liked was posted on the notice board along with the roster of who was on for which night. The list came about because the cry, "We don't know what to cook!" was driving me to distraction. The list contained meals that I had already taught both boys to cook. Though, I will never forget the night that we had a tuna alfredo meal where one DS used three cups of water plus one can of evaporated milk when it was supposed to be one can of evaporated milk made up to three cups. That was the first time he flew totally solo for the cooking process for that recipe. Boy was that one soggy alfredo! And he tried to repeat that mistake a few weeks later. My quick action and questioning of his measuring saved the day and luckily he learnt what 'make up to' meant. Thankfully, that was the only term that he had real troubles with. Both DSs are fully grown men now. Both are fabulous cooks - that is the best reward for teaching them how to cook." Well done, Patricia - you've certainly done a great job training your troops! Those big fat squishy marshmallow cubes coated in stalks of lightly toasted coconut are one of the best of my childhood memories. Mum used to buy them from Darrell-Lea on a Friday afternoon, and it was sheer bliss to cozy down on the couch and pass the bag around. I make my own now and they're still a melt-in-the-mouth treat and, even better, gluten-free so my daughter can have them too. They're so much nicer than the pink and white ones we've come to expect marshmallows to look like, and they're really well worth setting aside 30 minutes to whip them up. Optional: 1 tsp flavoured essence such as coconut, vanilla, peppermint, lemon, orange flower, rosewater and so on. A small shallow pan about 20 x 16cm, lined with baking paper, with an overhang at each end to enable you lift the set marshmallows out. Put the sugar and hot water into a small saucepan, and place over a medium heat. Stir constantly till the sugar dissolves. Mix the gelatine and cold water with a fork and pour it into the hot sugar syrup. Stir this over the heat until the gelatine dissolves. Remove the mixture from the heat and set it aside to cool for about half an hour. Pour the cooled mixture into your large bowl and beat on high until thick and voluminous. This can take up to ten minutes. Add the flavoured essence if you're using it and beat for one minute further. Pour the mixture into the lined pan and spread evenly, smoothing the surface. Allow to set at room temperature for about an hour. Once set, use the overhang to lift the marshmallow out onto the bench. Use a large wet knife to cut the marshmallow into large cubes. Put the toasted coconut into your deep bowl and using two forks, pick up each marshmallow and toss it in the coconut until it's well coated. Set the coated marshmallows aside on a platter and allow them to dry out for about an hour. Like that's gonna happen... lol! Ours disappear in about two days! What's the best thing growing in your garden? I came across a great thread from Little Miss Wonka on the Forum called What's the best thing growing in your garden? where she asked what other members were passionate about growing, so thought I'd run through some of the favourites we like to grow here. As it's winter at the moment I thought I'd start with some of our cool weather plants. Brassicas would have to be one of my favourite vegies to grow but we can only plant out some of them here in the cooler months due to our subtropical climate. From this broad family I would have to pick broccoli as my all-time favourite for a few reasons. My favourite part of this glorious plant, like most folks, would have to be the crunchy mass of underdeveloped flower buds referred to as the head. I really like the small raw florets added into a Thai-style curry or pour a hot wonton soup over them just before serving. My favourite way to eat broccoli would have to be raw in salads with other seasonal vegies like cauliflower, beetroot and peas and garnished with some flowers if available. I also like to add some lightly toasted macadamias or pine nuts and honey mustard dressing. Mmmm, hungry now. Second place would have to go to wombok/Chinese cabbage. I think the only way you can truly do justice to this vegetable is to use it raw in salads. I like to shred half a cabbage then toss with thinly sliced or julienned vegies and shredded greens. Toss in a few roasted cashews then dress with a soy, honey, vinegar and sesame oil mix. We eat this either as a stand-alone salad or topped with some roasted pork belly or chicken stir-fried in garlic, ginger and chilli. Sweet potatoes are another crop I love to grow. We're very lucky that our climate allows them to grow as a perennial, allowing us to bandicoot out small harvests year round. 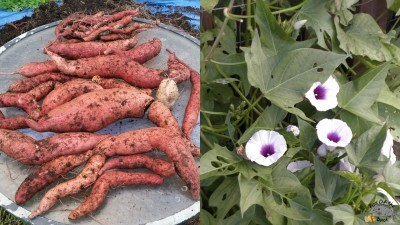 Sweet potatoes are a plant you can eat from the roots all the way up the plant to the flowers. We mainly eat the leaves in salads but you can also add them to stir -fries and I am interested to see how they would go in a palak curry. We have only just started to use the flowers in salads and find them to have a mild sweet taste. I love the root roasted, mashed, pan-fried and dehydrated as chips, but my favourite way to eat it would have to be in a Japanese sunshine curry. Something about the sauce makes it a perfect pairing to the sweet potato I think. One thing I like about growing sweet potato is that they grow really well in containers and the vines will happily grow up a trellis, making them a great plant to grow in small spaces. We grew three slips in a 100 litre plus container at the base of our back stairs and allowed it to grow up a wire trellis onto the hand rail. This made it very easy to quickly collect greens when we needed some extras to fill out salads. Only two of the slips we planted produced a decent amount of tubers (3.5kg/7.7lb all up) but when you add in the many salad greens we picked they actually provided us with a great deal of home-grown food. For those that are interested in a closer look at how the plants grew and the harvest we got, you can see a clip of it here on our YouTube channel. One of our favourite greens and a great warm climate spinach substitute would have to be Warragul greens/New Zealand spinach (Tetragonia tetragonioides). This awesome looking and tasting native ground cover is found growing wild on the coastlines of Australia and New Zealand. I have found it to be very hardy here and it will bounce back well if allowed to die off from lack of water (tries to look innocent). A few years ago the bed in the picture above was planted out with a single plant. It has slowly taken over the bed with the help of dozens of self-sown progeny. The plant can become quite invasive with runners stretching out quite a distance from the mother plant, so it is a good idea to keep an eye on it and prune back when necessary. We didn't and now there are dozens of young plants sprouting up in a barrel a few feet away from the main bed. The greens do contain high levels of oxalic acid so it is suggested that you steam or blanch the leaves before consuming. I like to pick too much when we're after some for dinner and once blanched, I add the excess into a container in the freezer so we have some on hand to help fill out a meal quickly. My favourite plant at the moment would have to be Okinawan spinach (Gynura crepioides). This plant is said to be a native of Indonesia and as a tropical plant it does love the warmer subtropical and tropical regions. Apparently it will also grow in warmer temperate regions, as long as it's kept in a nice warm position. We purchased a small plant and had it growing in a wicking barrel over last winter and weren't really impressed with the slow growth rate. As soon as things started to warm up last spring the plant exploded into life, sending out new branches every which way. Propagation is really easy. All I've done is pop in the left over stems we've picked the leaves off for dinner, straight into either jars of water or the grow beds in the aquaponics. They set out roots within a few days and have leaves ready for harvesting within a few weeks. 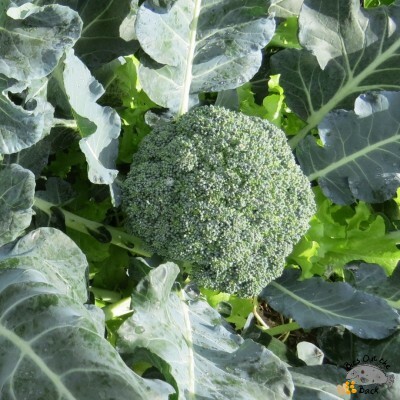 For folks with aquaponics systems I would recommend setting some grow bed space aside as we've found it grows extremely well in our system, giving us much faster growing plants with larger leaves than their mother plant growing in soil. Nearly everyone who has come to see our garden and aquaponics has left with at least a few cuttings to plant out in their own patch. ;-) Like most vegies, I prefer to eat it raw but have added it to a few stir-fries, as well as curries. I find it tastes like a cross between a lettuce and carrot with different undertones (no, I'm not a hipster foodie) depending on how mature the leaves are. I find the flavour very refreshing and would quite happily replace all our salad greens with this one plant, but Bianca won't let me. ;-) My favourite meal with it would have to be a basic salad filled with fresh picked herbs, veg, olives and diced fetta mixed through. I personally don't dress mine but Bianca and the girls like to add some red balsamic vinegar onto theirs at times. I must say that this plant has exceeded our expectations and gone on to provide us with so many meals that it now will be a permanent fixture in the patch. We do have a few more favourites like the gingers, asparagus, eggplants and water chestnuts but if I don't stop now I will be here for hours. ;-) Bianca would slap me if I forgot to mention honey pod peas. This is one of Bianca's wintery demands and I always ensure there is space for a few plants in the patch. I thought I'd leave you with a bit of a look at what we're picking from our early winter patch. The large tomatoes have been coming in thick and fast with a few being picked every other day. So far my favourites flavour-wise would have to be the Summer Time Gold Dwarf tomatoes. We have only taken the two off so far but have been very impressed with their sweet flavour and the amount of flesh. This was the second one to come off the plant (after I knocked it and cracked the skin) and it is one of the largest tomatoes we've grown. There are many more fruit to come off that plant and on the other one we have growing in a wicking bed. I have also been picking a few of these interesting looking 'brain' tomatoes. They do have a nice rich flavour but the plant isn't in the best position. I have started to save some seeds from a few fruit and will definitely be trying this variety again. We're still picking loads of the small yellow currents and red cherry tomatoes too. This lot was very tasty alongside some chocolate capsicum, chillies and basil on a pizza made by the girls and Bianca. That's about it for this month's blog, folks. Next time I'll include a bit of a walk around the garden clip for those interested in a wander through the patch and aquaponics. I hope everyone is enjoying the cooler weather and that you're lucky enough to be getting some great harvests from the patch. Well, that's your Simple Savings Newsletter for July 2015 and we hope you have enjoyed it. We can't wait to hear how you go with your 'swear jar'! Don't forget to check the Forum and Facebook for challenges and inspiration to help you get there.